Image: Common Loon with chick near a backcountry campsite in Algonquin Park on October 5, 2018 (click image to enlarge). The 2018 fall colour reporting season has concluded. Fall colour change reports will begin in early September 2019, or as conditions warrant. See the images on Facebook for examples of Algonquin Park's fall colour season, or see the information below to plan your trip in 2019. September 9, 2018 - A cold front with temperatures dipping to below freezing (-1°C on September 9, with a frost advisory) started the fall colour season in Algonquin Park. Increased colour change was noted in the following days. September 12 to 19, 2018 - Above seasonal temperatures for a week, with temperatures up to 28°C, caused maple trees to slow or stop their colour change. September 21, 2018 - Strong winds, heavy rain and thunderstorms (that blew over trees and knocked out power) did little to increase leaf fall in Algonquin Park. 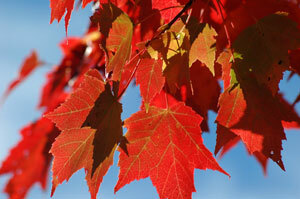 This indicates maple leaves are not yet fragile on twigs and have more colour change planned. September 22 to October 1, 2018 - A return to more seasonal temperatures encouraged daily fall colour change offering increasingly bright maple viewing opportunities. October 2, 2018 - The season's best viewing of Sugar and Red Maple fall colour at the canopy level in Algonquin Park is underway. Maple canopy colour may improve slightly over the next several days, but any strong winds could knock fragile leaves from twigs increasing what is known as leaf fall. 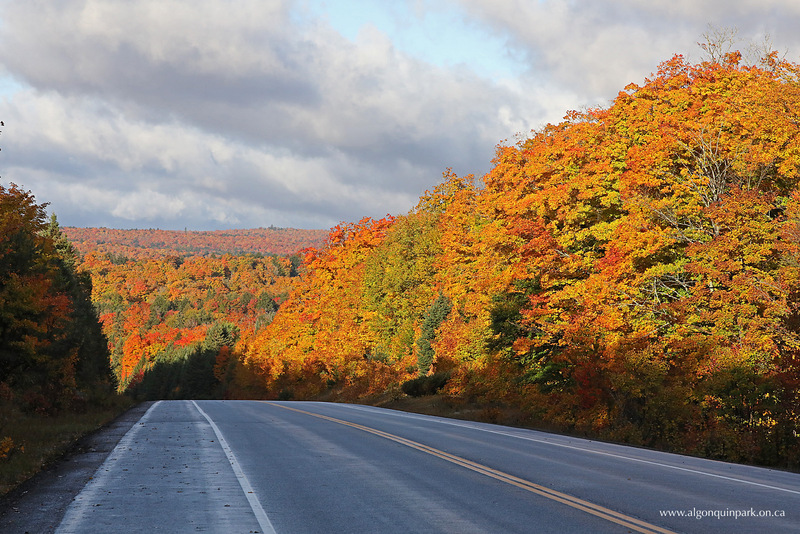 October 3, 2018 - The Sugar Maple canopy in the western portion of the Highway 60 Corridor of Algonquin Park reached peak intensity, while still retaining the maximum number of leaves. This combination of factors identifies 'peak' as described in more than 40 years of observations. The peak maple canopy colour in 2018 was almost a week later than the average of September 27. October 4, 2018 - Strong winds associated with a passing cold front knocked some fragile maple leaves from the canopy increasing leaf fall in Algonquin Park. October 5 to 8, 2018 - Great maple colour is persisting in Algonquin Park with generally light winds, but leaf fall is slowly increasing. Both the maple understory and poplar colour are increasing. October 9, 2018 - Thunderstorms and strong winds (associated with unseasonably warm temperatures to 25°C) increased leaf fall in the maple canopy, especially in the western portion of Highway 60. October 11, 2018 - Poplar (aspen) has made a dramatic transformation in the past 48 hours with near peak yellow/orange colour recorded in the eastern portion of Highway 60. Excellent viewing is now possible at the Visitor Centre, Rock Lake Road, Centennial Ridges Road, and on the Algonquin Park Webcam. October 15, 2018 - Strong winds increased leaf fall in the remaining maple understory and in poplar dominated areas. The maple canopy is bare in most areas of Algonquin Park. 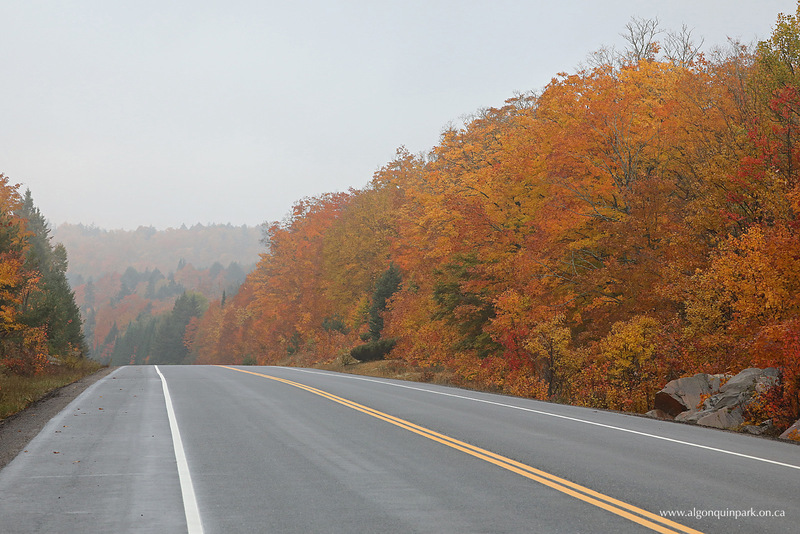 October 22, 2018 - Tamarack colour in the eastern portion of the Highway 60 Corridor is offering good viewing opportunities. 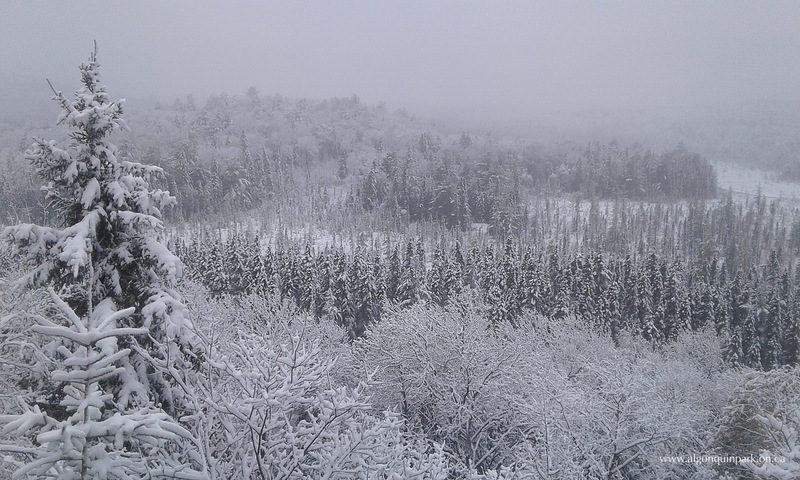 October 24, 2018 - A few centimetres of snow overnight made sections of Algonquin Park turn into a 'winter wonderland' and helped to increase leaf fall on remaining tree species such as poplar and Tamarack. 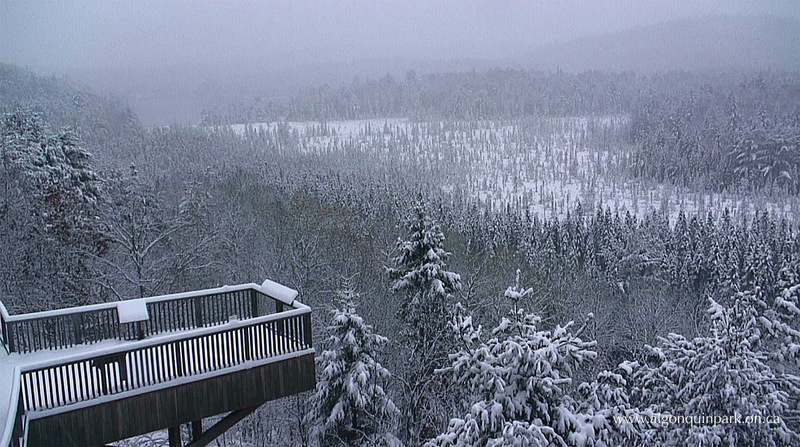 October 28, 2018 - Another snowfall, now with a snow depth of 14 centimetres measured at the Park's East Gate, ended Algonquin Park's fall colour viewing season. When Should I Visit Algonquin Park? A trip to Algonquin Park between mid-September and mid-October is best for observing Algonquin Park's fall colour, but more precision regarding an exact date depends upon what species of tree you are interested in observing. Algonquin Park is home to 34 native species of trees. Of these species 10 are classified as conifers (cone bearing) and will retain their leaves (needles) year-round and are often referred to as "evergreen". The only exception is the Tamarack that changes to golden yellow colour before dropping its needles in preparation for winter. 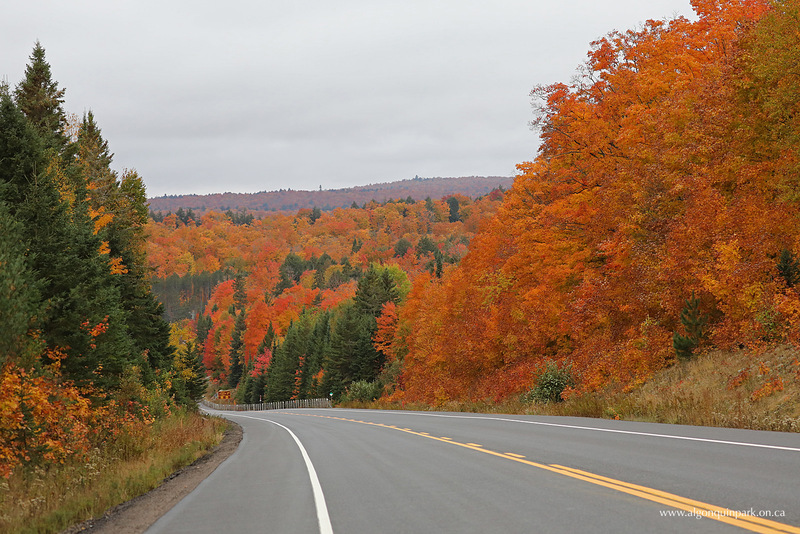 The other 24 species of deciduous trees change colour at different times, depending upon the species, their location in Algonquin Park, and the specific environmental conditions in that area. No tree happens to grow in a random location, rather each tree struggles against great odds and hazards for a place in the sun and each species is subtly equipped to do better than its competition in certain conditions. 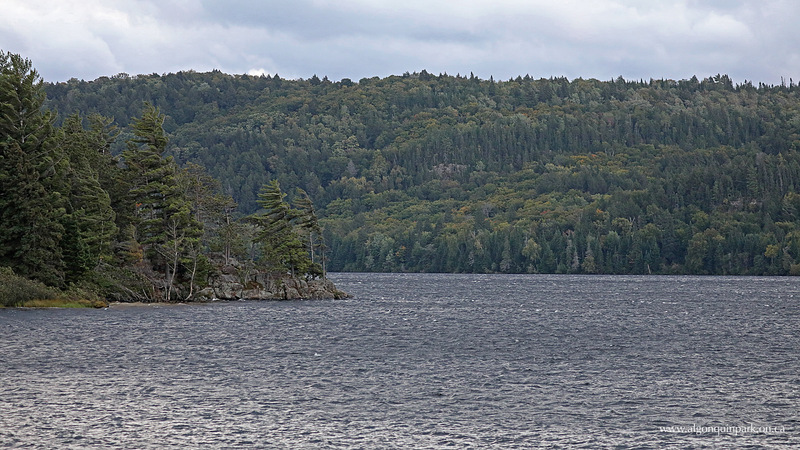 Certain species of trees grow in different locations in Algonquin Park. Therefore the mosaic of forest types in Algonquin Park is no accident but is determined by soil type, moisture, climate, etc. resulting in the amazing blend of green, yellow, orange, red, and purple colours that makes Algonquin Park's fall colour so special. 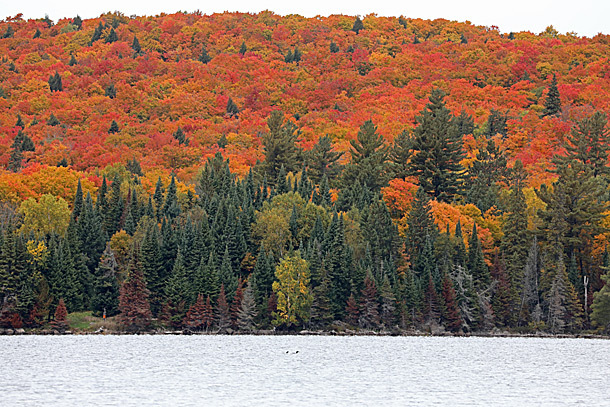 Traditionally, Algonquin Park's fall colour occurs earlier than surrounding areas because of the Park's higher elevation, up to almost 600 metres above sea level. This can mean the best colour is observed several weeks (or more!) 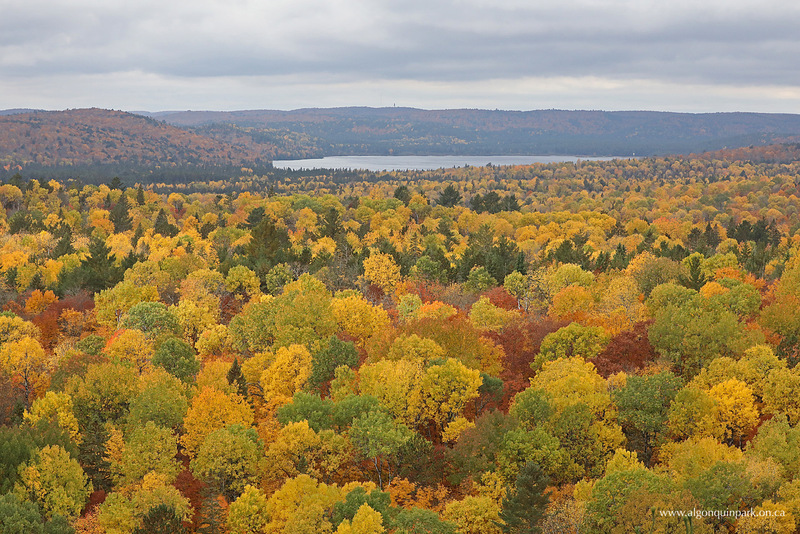 prior to leaf colour change in places like Ottawa (70 metres above sea level), Toronto (75 metres above sea level), or even communities just outside Algonquin Park's boundaries. Algonquin Park’s high elevation, thin soils, and cooler temperatures results in a shorter growing season for all plants including its trees. If visiting Algonquin Park during mid-September to early October, you will observe the colour change of the Sugar Maples and Red Maples. This fall colour covers hills in orange and red colours and is best observed at locations with expansive views such as trails and views across water. During the past 40+ years, the earliest Sugar Maple peak recorded was September 15, 1982 and the latest October 9, 1996. During 2016, the peak Sugar Maple colour was determined to be October 6 (almost record late), as a result of warm fall temperatures and a late frost. The average peak of the Sugar Maple canopy in the western portion of the Highway 60 Corridor is September 27. 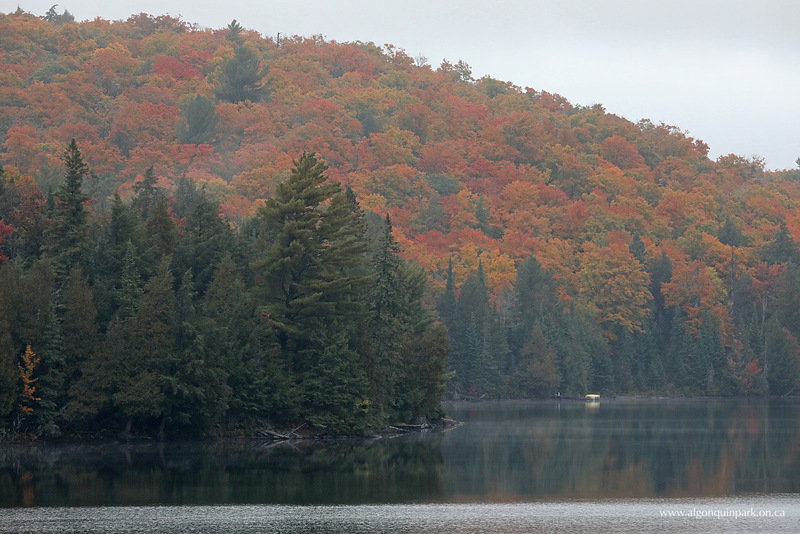 See the current status of Algonquin Park's colour change above. 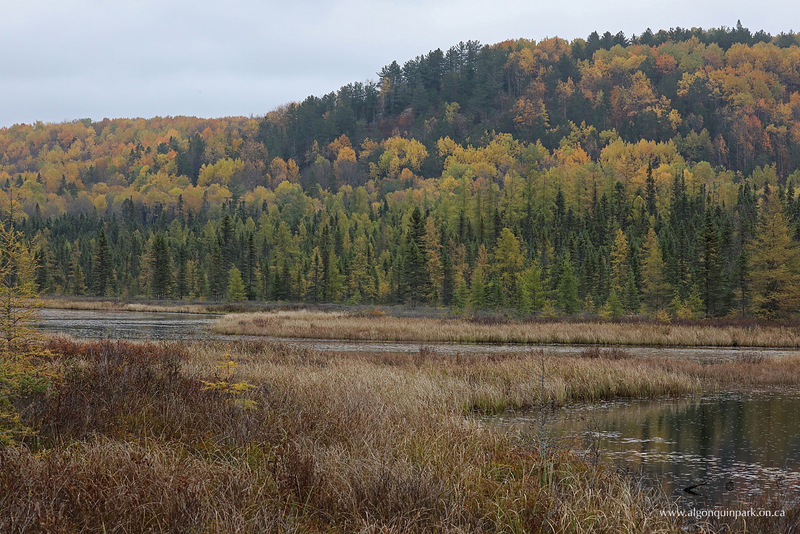 An Algonquin Park visit between early to mid October (including Thanksgiving) will observe the yellow-orange colours displayed by poplar and birch species, plus the orange colour of the Sugar Maple understory. This time known as the "Golden Encore" generally occurs after the Sugar Maple and Red Maple peak colour, but offers great landscape views in poplar and birch dominated areas. 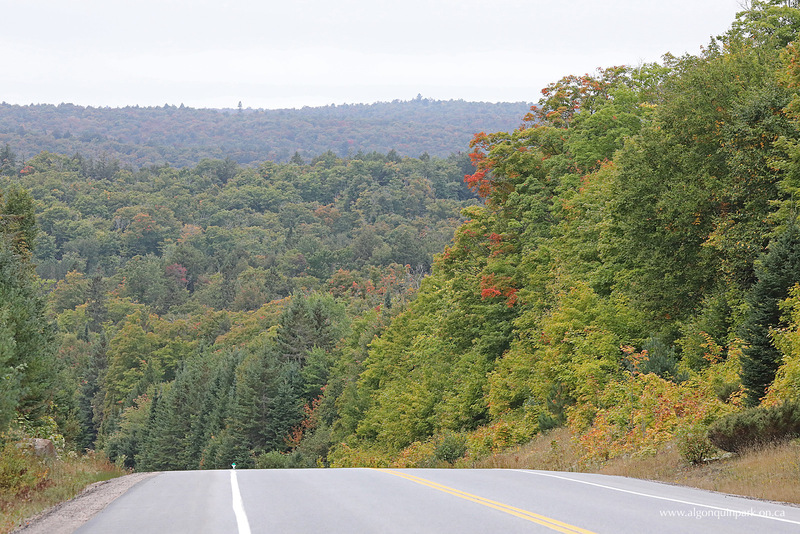 The eastern portion of the Highway 60 Corridor and the Park's East Side is a great location to view this colour. Once leaves have fallen from the tops of the Sugar Maples, the understory changes colour at ground level as it was previously protected from cold temperatures by the blanket of overhead leaves. A hike along an interpretive trail dominated by maples is a great way to see understory fall colour up close. 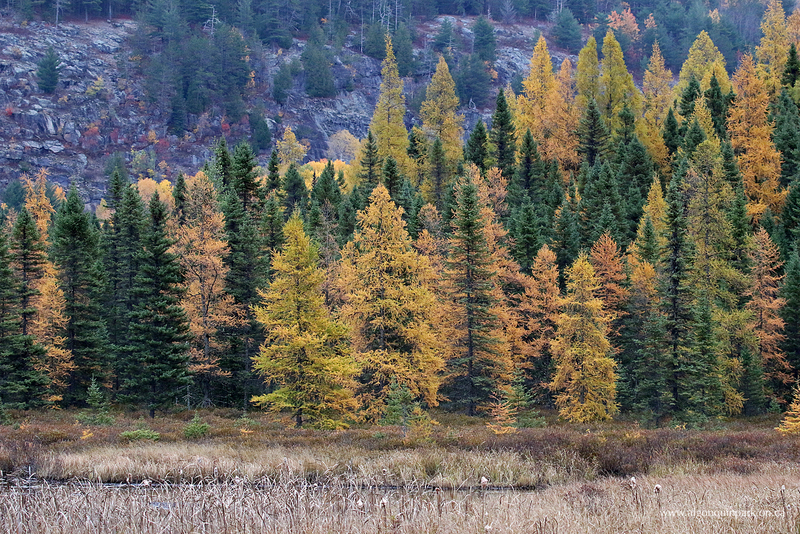 A mid to late October visit showcases Tamarack at their peak yellow colour before dropping their needles in preparation for winter. The Tamarack is Algonquin Park's only cone bearing tree that changes colour and drops all its needles in preparation for winter. Search for Tamaracks in wetlands and bogs including the Spruce Bog Boardwalk, the Mizzy Lake Trail, or along the Opeongo Road. By late October or early November (depending upon environmental conditions) all deciduous trees are bare and prepared for winter. During the past 40+ years, the earliest Sugar Maple peak recorded in Algonquin Park was September 15 (1982) and the latest October 9 (1996). During 2015 and 2016, the peak Sugar Maple colour was determined to be October 8 (almost record late) and October 5, respectively. During 2017, the Sugar Maple peak colour was September 28. The peak colour in 2018 was October 3. 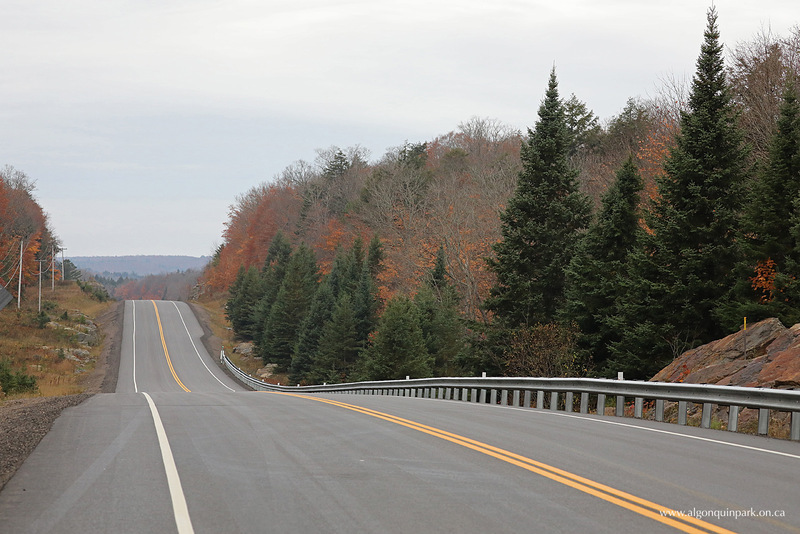 The average peak of the Sugar Maple canopy in the western portion of the Highway 60 Corridor is September 27. 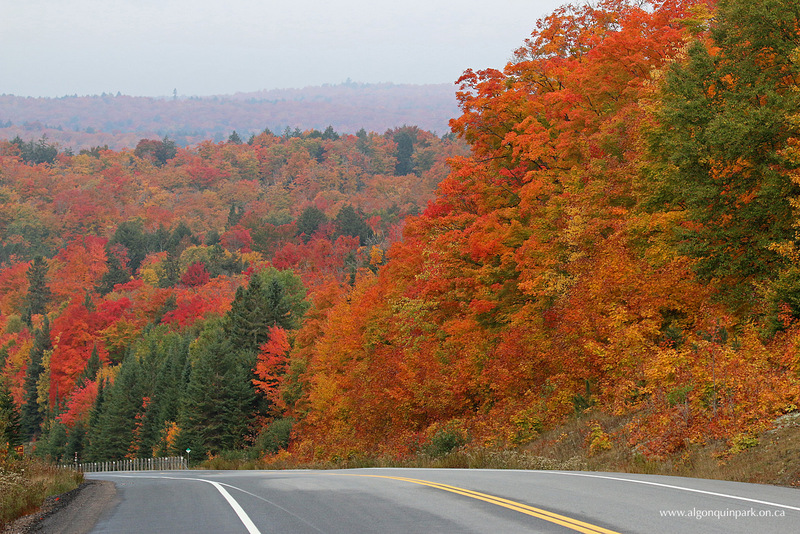 The best fall colour watching in Algonquin Park is expected from mid-September to mid-October. Fall colour is subject to numerous environmental variables such as daylight length, moisture, temperature, frost, wind, heavy rain, etc., so the exact peak of fall colour is difficult to determine in advance. High winds, rain, or even snow can sometimes quickly result in fragile leaves being knocked off the trees increasing what is called leaf fall. Why Does Fall Colour Happen? Algonquin Park is ablaze with vibrant colours during September and October. In a landscape so often dominated by the green of summer, how does this brief explosion of reds, oranges, and yellows happen in the early autumn? The answer involves a complex process of numerous chemicals and environmental variables. Read more at Why Does Fall Leaf Colour Change Happen? Where Should I Visit in Algonquin Park? The "Algonquin Dome" refers to the high elevation piece of the Canadian Shield that underlies the western two-thirds of Algonquin Park. Here an ancient mountain range continues to exist increasing elevation well above that of surrounding areas (primarily outside the Park). These ancient rolling hills covered by soils deposited by a glacier thousands of years ago, created suitable conditions for the growth of maples. The maples - primarily Sugar, Red and Striped - experience a cooler climate than those outside the Park area as a result of the higher elevation. These cooler conditions and the resulting shorter growing season make for an early fall and thus an earlier fall colour watching season than other locations in southern Ontario. 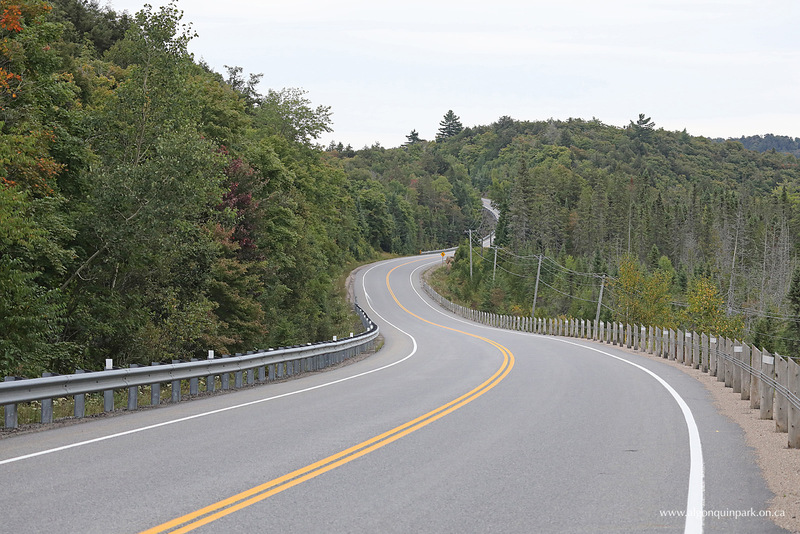 Fortunately for visitors, Highway 60 runs through a large section of Algonquin Park's higher elevation. 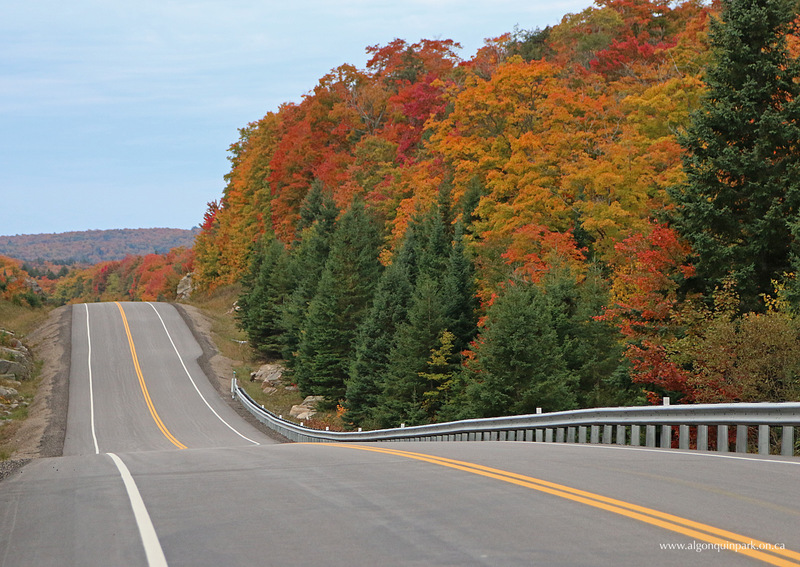 The Highway 60 Corridor provides easy access to the Park area dominated by these three species of maples for keen "leaf peepers". 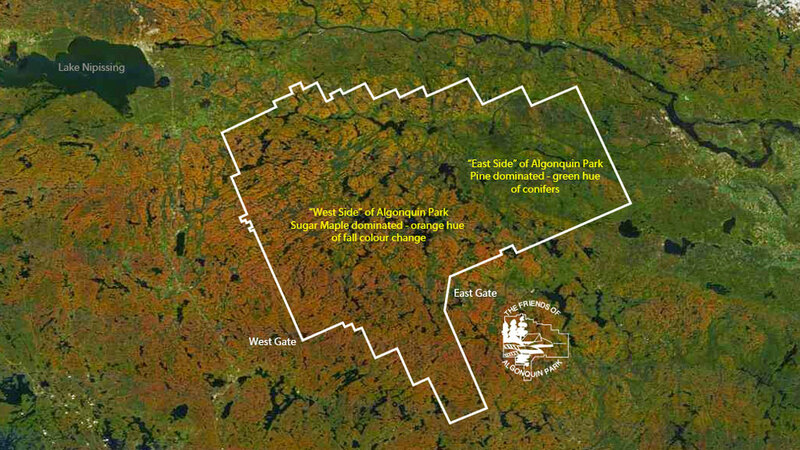 Below is a satellite image taken near the peak of the Sugar Maple canopy showing the red/orange colour of the Sugar Maples and the boundary of Algonquin Park. 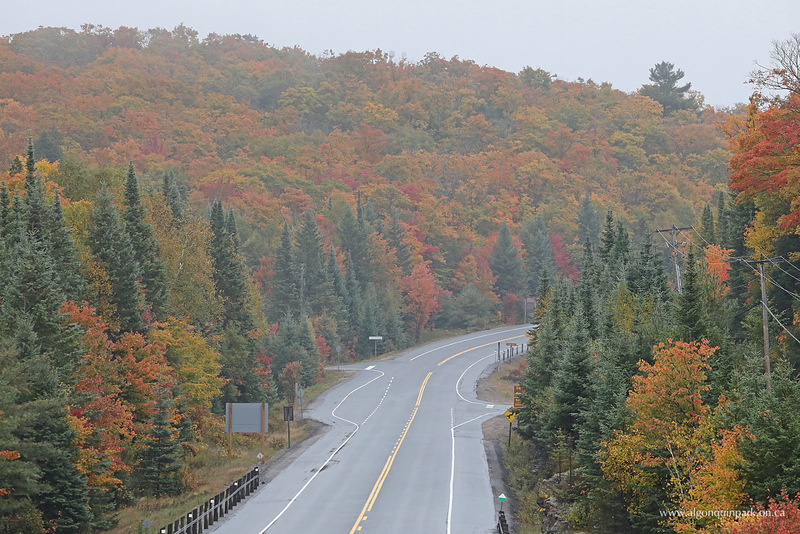 Algonquin Park's West Side including the Highway 60 Corridor is dominated by maples, while the Park's East Side is dominated by pines that show green needles that do not change colour. This satellite image was taken on October 1, 2012.